Sometimes the people who seem to have and be everything that everyone else wants to be, are considerably different than what they represent behind closed doors. On the surface, siblings Brenda and Brian Andrews have the looks, money and confidence to make any prospective dating partner second guess their own worth. Unfortunately for them, and their chosen partners, the chaotic, manipulative & promiscuous lives they’re truly leading makes them far from the fairy tale catches they’d like to believe they are. When their often abusive & alcoholic father dies under bizarre circumstances at their parent’s home, their mother’s peculiar explanation and suspicious behavior lead them to suspect there’s more to the story than what she’s telling. After the doorway to dark family secrets is suddenly flung open at the funeral, many dust covered skeletons begin tumbling out. Soon the pedestals that Brenda and Brian once stood on begin crumbling beneath their feet, plunging them into a dangerous descent that they may never be able to come back from! This book was really good and kept me fully entertained. The characters were easy to understand and connect with. You don’t get an immediate sense of their background but as the story moves along you begin to understand a little bit more about the complexities of both Brian and Brenda’s personalities. Though there were times when Brian frustrated me, there were others where I he just made me laugh out loud. He’s definitely not a boring character and he always has something to say. Although he tries to hide his true feelings through his I-don’t-care-about-anything exterior, he is not a bad person underneath. He’s just been through a lot and the only way he knows how to deal with things is by portraying himself as a tough guy. Brenda is a strong female character who’s easy to understand and relate to. She’s a strong independent woman who has lacked affection from her father and because of this; she gets pulled into a relationship that is not right for her. Overall, I really enjoyed this book and look forward to reading more from K.F. Johnson. KF Johnson was born and raised in Queens New York and developed a vivid imagination and an aptitude for creative writing, drawing and anything else entertaining at a very young age. Her first glimpse of writing success came in the sixth grade when she won a New York City statewide poetry writing contest. During and after she obtained a BA Degree in Psychology from Spelman College, she was a featured rapper, actress and dancer in stage shows, videos, commercials and movie shorts. This jack of many trades also obtained a Master’s Degree in Business but is now only passionate about mastering one; writing. 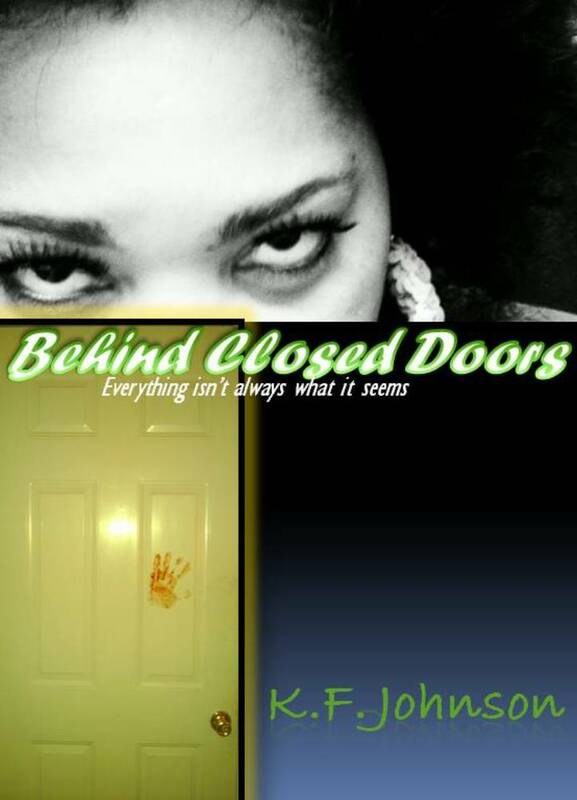 Behind Closed Doors is her first published novel. She now resides in Atlanta Georgia with her family.